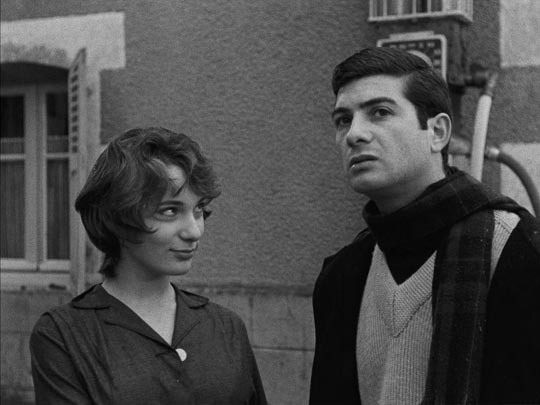 While waiting for a review copy of Jean-Luc Godard’s Weekend to arrive recently, I dipped into the French New Wave to watch a few films I’d previously missed – Claude Chabrol’s first two features, Le Beau Serge and Les Cousins, and Agnes Varda’s Le Bonheur. 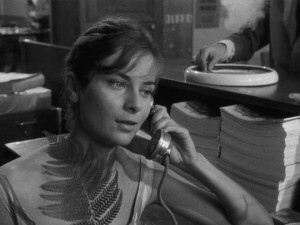 Although Varda started her career before any of the Cahiers du Cinema critics picked up a camera, with La Pointe-Courte in 1955, a film which clearly provides a bridge between neo-realism and the nouvelle vague, she isn’t always included in the pantheon. Whether there’s a degree of sexism in this is open to debate. 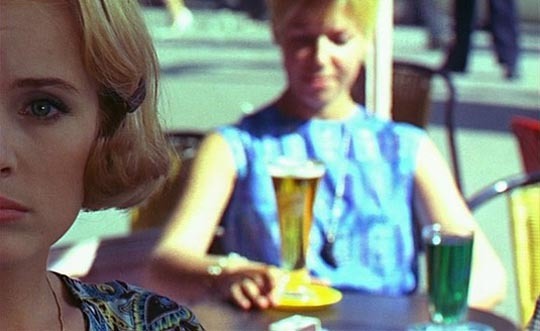 Le Bonheur (Happiness, 1965) was her third feature, after La Pointe-Courte and Cleo From 5 to 7 (1962), with a number of documentaries and shorts made in between. Much of Varda’s work is marked by a lightness and charm, a great deal of empathy for her characters, but she is also a clear-eyed observer of the ways in which people can suffer when social ties are damaged or broken (Vagabond, 1985, is particularly bleak). 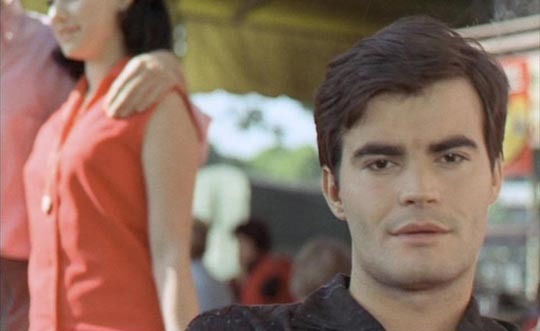 Le Bonheur is a difficult film to grasp because it presents such a warm and sunny surface while something painfully dark lurks just out of sight. Jean-Claude Drouet and Claire Drouet appear as a blissfully married couple, Francois and Therese Chevalier, their two children played by the actors’ own children. The film starts on a sunny day with a family picnic in the country … Varda evokes a comfortable sense of deeply held affection; this man and his wife have been together a long time and are still very much in love. Then, while away on a job, Francois encounters Emilie (Marie-France Boyer), a charming post office clerk, and they are immediately attracted to one another. The happy Francois finds that this new relationship, which quite quickly develops into an affair, simply multiplies his happiness. It takes nothing away from his affection for Therese, but instead – at least in his view – reinforces and deepens those feelings. When Francois finally shares this new happiness with Therese, once again during a family picnic in the country, expecting her own happiness to be enhanced by his increased joy, they make love while the children nap nearby and then he contentedly falls asleep. 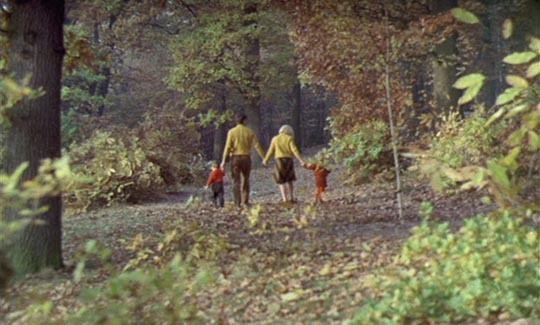 On waking, he finds Therese gone … with increasing panic, he and the children run through the woods looking for her. And finally, she’s found, being pulled from the nearby river. Varda doesn’t make it clear how the death occurred – Francois has a brief vision of his wife struggling in the water as if she had fallen in by accident, but the possibility is there that she has committed suicide to free him to be with his new love. In time, grief fades and Francois settles down with Emilie, who has slipped easily into the role of wife and mother and once again he is happy. Varda absolutely refuses to offer any kind of authorial judgement on what we see. As viewers we might consider Francois a totally self-centred narcissist, completely blind to the effects his own idea of happiness has on those around him; but the other characters also seem to slip easily into his view of the world and my desire for Varda to come out and say whether or not she agrees with him ended up leaving me frustrated and almost angry at the film. It strikes me as remarkable that by simply leaving me to make up my own mind about this character’s behaviour the filmmaker could provoke such a powerful response from me. Le Bonheur is as radical as anything made by any of the other New Wave directors. After Godard, Claude Chabrol was the most prolific of the New Wave directors, with more than fifty features and numerous shorts and TV productions to his credit. Unlike Godard, Chabrol has never been a radical stylist, his films generally quite traditional in form, with a humanist perspective, albeit one much more sour than Francois Truffaut’s often more sentimental view of life. Chabrol’s overriding project has been the dissection of bourgeois hypocrisy, generally through stories of crime and corruption. 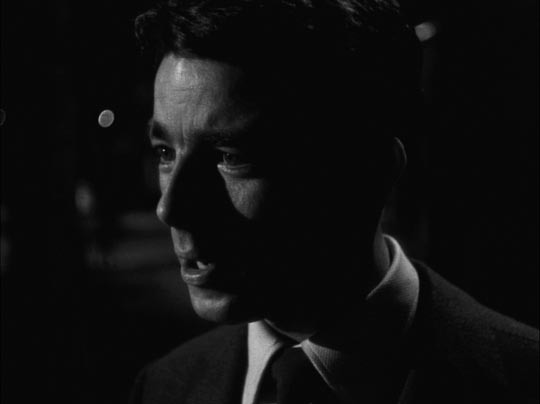 His first two features, however, although based on original scripts, have a distinctively literary flavour. The first of them, Le Beau Serge (1958), builds to a kind of religious allegory about a descent into sin and a subsequent rise to redemption; the second, Les Cousins (1959), offers the descent without the redemption. The two films mirror each other in many ways, and together they present a somewhat conservative view which holds that the city is a kind of purgatory where souls become lost while the country is a place where lost souls may be renewed. The parallels are heightened by the casting of Gerard Blain and Jean-Claude Brialy as the leads in both films. In the first, Brialy is Francois, a man who, for reasons of health, returns to his provincial home town after years away in the city. There he finds his old friend Serge now reduced to a stumbling alcoholic trapped in a bitter marriage to Yvonne (Michele Meritz). As Francois tries to discover the source of his old friend’s despair, he learns that Serge became trapped in the small town when he got Yvonne pregnant and felt obliged to marry her; their child was deformed and died at birth. Now that she’s pregnant again, he’s terrified that the pain will be repeated. 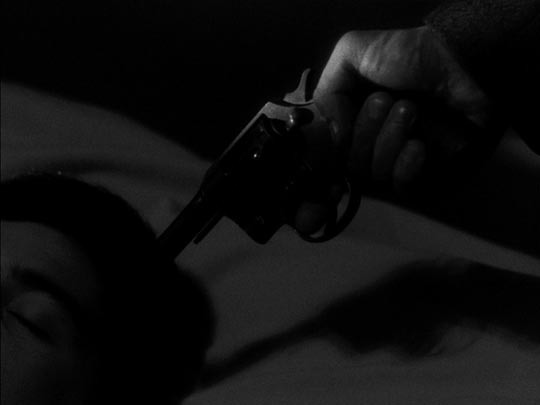 Francois also becomes involved with Marie (Bernadette Lafont), whose almost feral sexuality virtually overwhelms him. She has been raised by the drunkard M. Glomaud who may or may not be her biological father. In trying to intervene to help her, Francois triggers an act of sexual violence. In fact, all his efforts (rooted in an unspoken sense of superiority for having himself escaped the town) tend to aggravate the situations he wants to ameliorate. Becoming weaker himself – the stresses he faces working against the idea of rest and recuperation – Francois comes close to dying as he struggles on a snowy night to get help for Yvonne as she gives birth and to find Serge, who has disappeared, and bring him back to his wife and new child. For a first feature, Le Beau Serge is remarkably assured. Henri Decae’s black and white cinematography captures the harsh environment of the small town in luminous images. The performances are rich and deeply felt, and the stylistic naturalism supports the allegorical elements effortlessly. 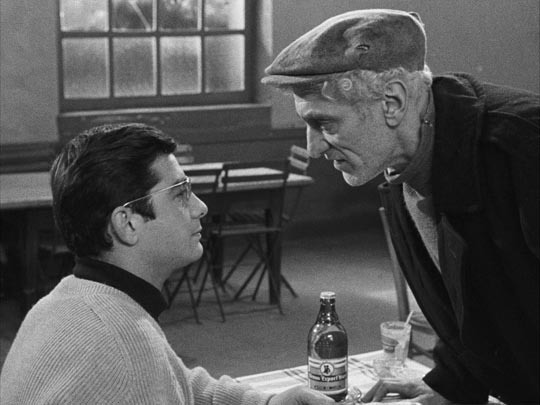 In contrast, Les Cousins has a jazzier, more “urban” style heightened by the deliberately exaggerated performance styles of, particularly, Brialy as Paul, the “city cousin”, and Paul’s parasitic acquaintance Clovis (Claude Cerval). These characters come close to parodies of decadence. Their existence is an endless round of parties and contemptuous ridicule of less sophisticated people. Charles (Blaine) arrives from the country to move in with Paul while he goes to law school; his cousin’s lifestyle constantly undermines his earnest academic ambitions, sidetracking him with emotional attachments to women who play with feelings rather than feel them deeply. 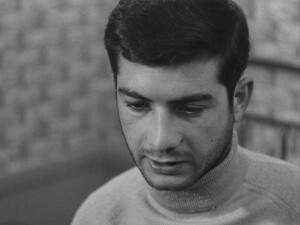 While Paul breezes through school with no apparent effort, never allowing studies to interfere with his social life, Charles desperately struggles to prepare for his exams while dealing with deeply conflicted emotions, a sense of betrayal, arising from a brief affair with Florence (Juliette Mayniel), a woman with a “past” who herself has trouble dealing with simple honest emotions. 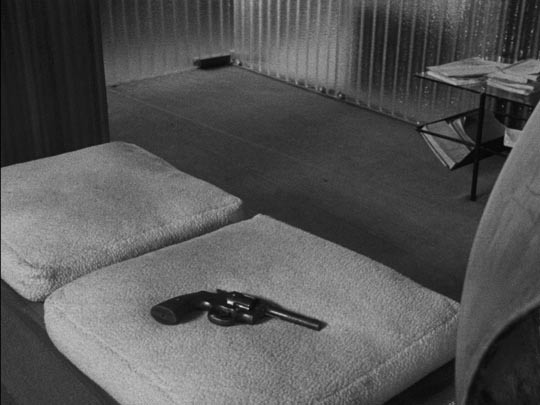 Out of his depth, it’s almost inevitable that things will end badly for Charles and Chabrol faithfully follows the dramatic dictum that if you show a gun in the first act it had better be used in the third. 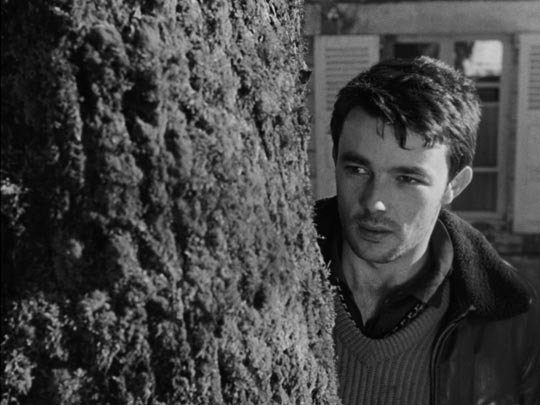 While it’s obvious that Chabrol was experimenting in Les Cousins, aiming for a kind of improvisational visual jazz rather than the previous film’s naturalism, there’s a certain artificiality to the film which makes it slightly less satisfying than its predecessor. But already in these first two features, you can see his fascination with character and social behaviours, the internal and external forces which drive people to act in ways which are not necessarily in their own or other people’s best interests. 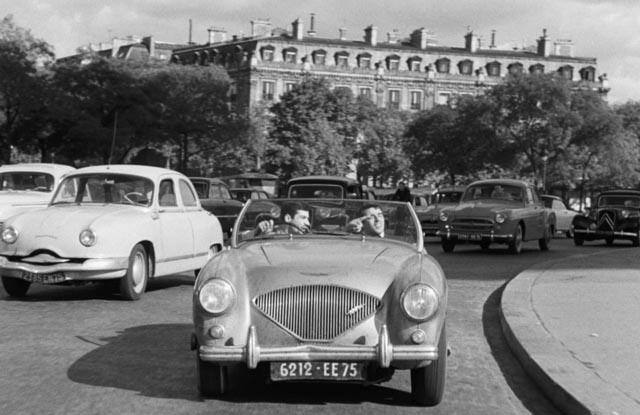 This entry was posted in Review and tagged Criterion, Directors, French Film, New Wave, Review. Bookmark the permalink.